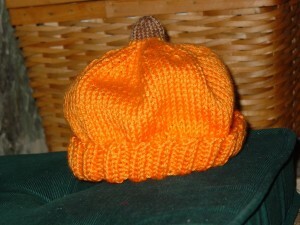 PJ’s pumpkin cap is complete and tomorrow, I’ll see if it fits. I’ve made pumpkin caps with leaves and curly stems, but I think they look a little feminine. This one is just a bigger version of the one I made him last year. The yarn is Caron Simply Soft in Mango. The stem is knit from a small skein of leftover yarn that’s like the gift of the Maccabees. Every time I need a small amount of light brown yarn, there it is! I think I bought it years ago when Kmart still carried yarn. I know it’s worsted weight acrylic, but I have no idea what brand it is. I tied on the light brown yarn. I worked app. 6 more rounds using the light brown yarn. This formed the stem. I finished by knitting two together all the way around, cutting my yarn leaving a 4 inch tail. I threaded a large tapestry needle with the tail and ran it through the remaining loops on my needles. I gathered them up as I removed them from the needles. I pushed my needle through to the wrong side, turned the cap inside out and knotted the tread. I wove the brown tail through the wrong side of the stem and trimmed it. I cut the remaining mango (orange) thread from the skein and secured that tail and the original one. I turned it right side out, folded the brim, and there you have it! I hope it fits. 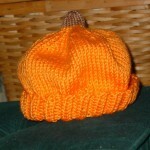 Filed under baby caps, decreasing, enlarging, knitting, pumpkin cap, stem |	Comments Off on Finished!